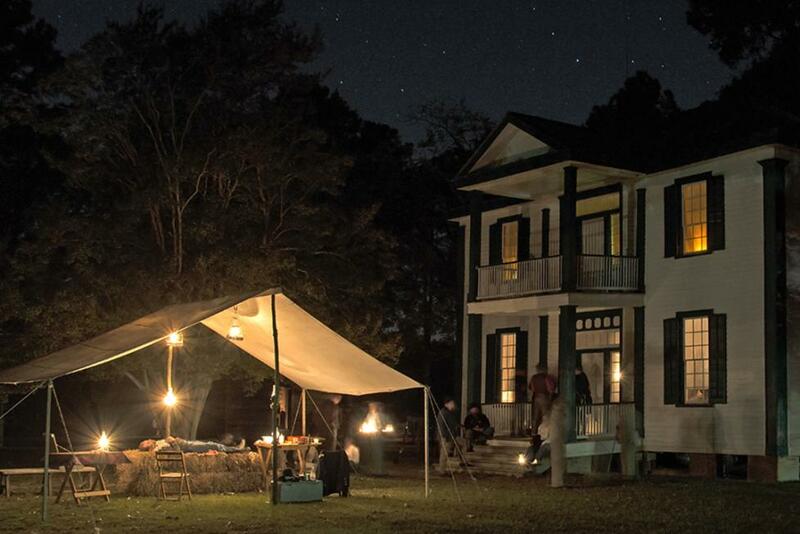 Visit NC, a unit of the new Economic Development Partnership of North Carolina, announced on December 15th that the Bentonville Battlefield State Historic Site&apos;s Harper House will grace the cover of the 2015 NC Travel Guide. There will be 600,000 guides printed to promote North Carolina, half with the Bentonville cover and the Outer Banks on the other half. This must be what it feels like to be on the cover of Rolling Stone Magazine. For a tourism destination our size to make the cover of the state&apos;s top destination marketing piece, that&apos;s as good as it gets. What an honor for our historic site as they prepare for the 150th Reenactment events, March 21-22, the publicity value is tremendous. In addition to the cover, the bureau has put together a Sweepstakes Get-a-way which will run on the Visitnc.com website until January 31st. The offer includes a weekend stay at the Fairfield Inn & Suites with one-of-a-kind personal tours at Double Barley, Hinnant Winery and the Ava Gardner Museum. The grand prize also includes gift cards to Carolina Premium Outlet, Serendipity Road Restaurant, and a gift bag from the Visitors Bureau. A bonus for the winner will be tickets to the 150th Re-enactment at Bentonville Battlefield next March. The North Carolina Division of Tourism, Film and Sports Development recently announced that domestic visitors traveling more than 50 miles to Johnston County spent $204.51 in 2013, an increase of 3.5 percent over 2012 figures. Other signs the tourism industry is healthy in Johnston County includes new hotel development, investment in new tourism attractions, and openings of service industry businesses like restaurants, retail, and transportation companies. The mission of the Johnston County Visitors Bureau is to attract and serve visitors to the county, therefore, improving the economic well-being of all communities through increased visitor spending and tourism development. Find out more on our website. 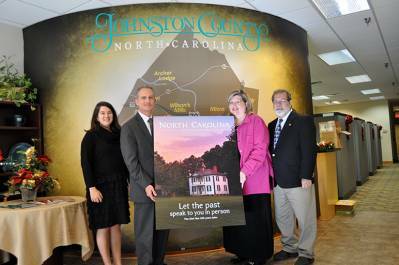 Pictured left to right: Lynn Daniels, Johnston County Tourism Authority, Wit Tuttell, Executive Director, Visit NC, Donna Bailey-Taylor, Johnston County Visitors Bureau, Executive Director, Donny Taylor, Site Manager, Bentonville Battlefield State Historic Site.